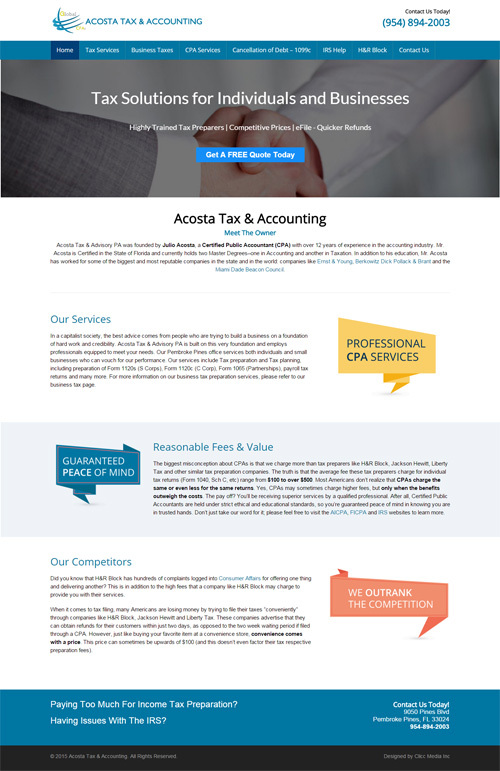 We are happy to announce a new web redesign for Acosta Tax & Accounting, a Pembroke Pines CPA firm helping individuals and small businesses with their tax needs. Acosta Tax & Accounting was previously designed on a Joomla platform – it was outdated, loading very slowly and not properly optimized for web. We took the website and redesigned it on a WordPress platform instead of keeping it on Joomla, for specific SEO purposes. We gave it a new clean look with higher quality stock images, broke down the home information into section to make it easier for the visitor to read and more importantly it is responsive so now it will be easy to navigate on mobile. Below you can see the before and after screenshots – let us know what you think and if you are considering redesigning your website contact us today for a free quote.